The graphics and visual experience is phenomenal. Call bets and Neighbour bets are available. There are a lot of optional extra’s to make a more tailored experience. The bet types may be hard to learn. It can be quite confusing and complicated with the wide variety of features and options. There is a low-percentage game for the player. European Roulette Gold is the most realistic form of Roulette and is the closest thing to an actual Roulette experience at a land based casino. You get to enjoy all high quality features and options straight from the comfort of your own home and it’s great for beginners and experts alike. For starters, the graphics are just phenomenal. The wheel and table are true-to-life and the humming chatter and casino background sounds make you feel as if you are truly living through the experience. Unlike in American Roulette, the wheel has only a single zero (there is no double zero). This means that there is a slightly greater percentage of a red or a black number coming up on the wheel. 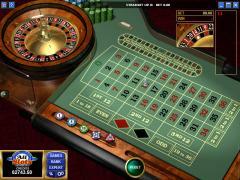 The Roulette wheel consists of 1 – 36 in addition to the zero. The basic Roulette objective remains the same. You select the number you think the ball will land on and place your chips accordingly on the numbers on the table layout. There are charts which document the result of past spins including how much of the layout your wagers covered. The great thing about this game is that you can change the layout and view to suit you. If you’re not happy with the angle, you can use the “Edit Layout” option to get an overhead view of the table, place your bets as required and then save that particular pattern to be converted over to normal view. There are different denominations of chips in the virtual tray, so you can simply pick the bet level that suits you. You can choose your different bets like Street Bets, Split Bets, Straight Up Bets, Line Bets and many more.